Today, I can't wait to share this wonderful long form video interview I recently discovered. Talk about inspirational words on creativity, art, authenticity and the meaning of life! This Chase Jarvis interview with Brené Brown has it all! "Daring Greatly to Unlock Your Creativity with Brené Brown" is a spectacular episode of Chase Jarvis Live, well worth the 90 minutes. The relaxed conversation comes free of sound bites and instead allows the two speakers to develop ideas which Brown has presented in her book, Daring Greatly, in the specific context of creative people (which, is, in fact, all of us). Spirited scribblers of all sorts--you will love this. Enjoy. Some of my most spirited and energetic scribbles happen when I copy someone else's work. Not to pass off as my own, of course. Instead, I copy to absorb some of what I admire--the technique, the impact, of a particular author. I've done this for years in my scribblings with words. I keep what I call Mentor Novels on my desk when I write my own fiction. When I'm writing and hit a slump, I can open to any page of my well-read mentor novel and simply start typing. Yep, I actually just type right into my own document the words straight out of that novel. I know those words aren't mine and of course I cut them from my document only minutes later. But the act of typing them--not just reading them--never fails to job my own words and energy loose from whatever has it stuck. Usually within a couple of minutes, my own unique scribblings start to flow again. My authentic voice is actually more free to emerge when given permission and inspiration by someone else's creative voice. I have found this technique so useful, I've taught it to my writing students for years. And I have used it in my visual art as well, copying drawings and paintings from too many artists to count. What can I learn? What can I absorb? What will help me create my own art? 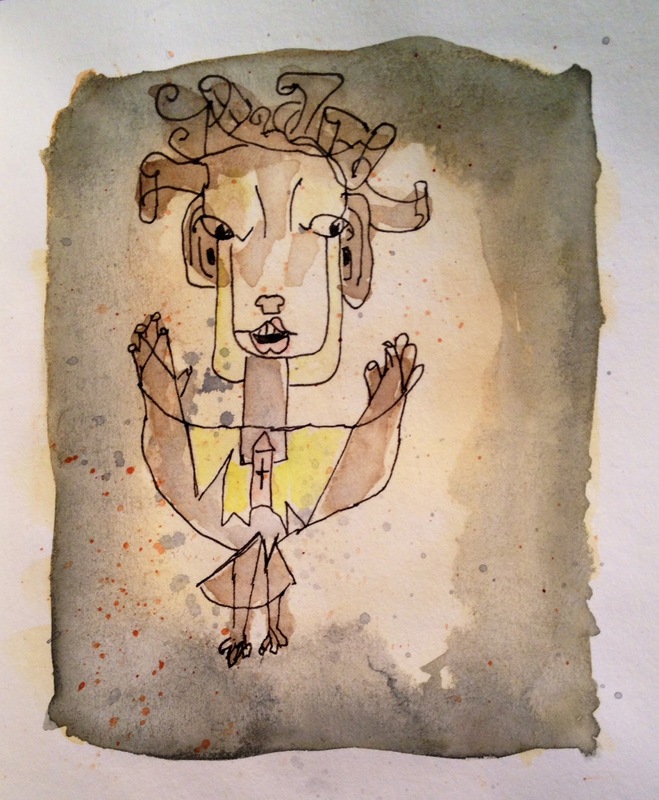 Recently, thanks to a prompt from Sketchbook Skool, I sat down to "copy" the oil transfer monoprint "Angelus Novus" by Paul Klee. You can read more about it here. Of course, the goal (at least for me) is not to produce an exact copy. 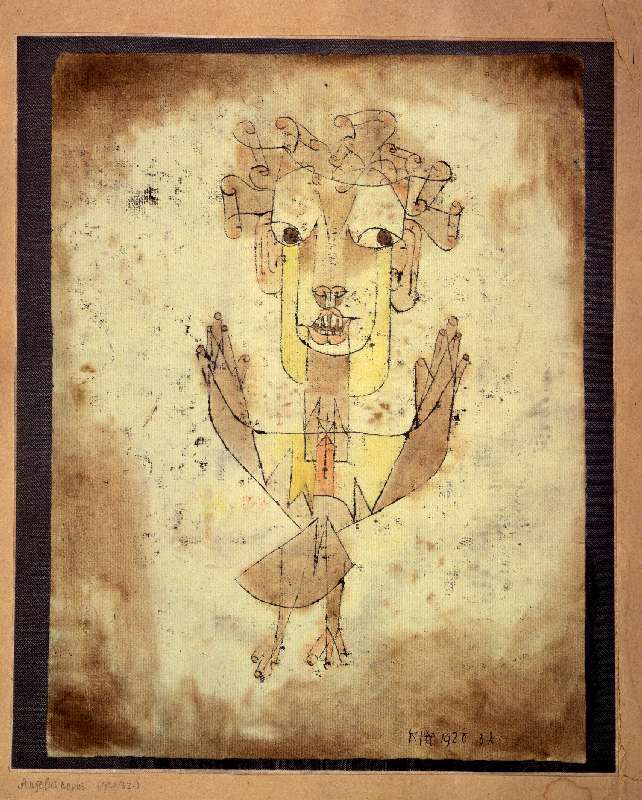 Instead it is to learn a little bit about how Klee did what he did so that I can use some of that technique in the future in my own drawing. Here is mine, done in watercolor and ink. variety in background wash adds interest to the drawing. what feels almost monochromatic isn't--and that little splash of read in the middle matters. geometrics (which I didn't do very well) produce really interesting effects and I should plaly with them more. the eyes looking off the page add intrigue. As I drew, this reminded me of the watercolor and ink work of Felix Scheinberger, whose work (and book on watercolor sketching) I love. I want to try copying this piece again, just to see what happens a second time! Scribbling with spirit only happens because of images. Drawn. Spelled out in letters and words. Conveyed with words and pictures working together. Scribbling is image-making. And image sharing. One of my great heroes in the world of scribbling is cartoonist Lynda Barry. In addition to collections of her comics and to novels she has several truly excellent books out about images, art, drawing, life... I recommend them all. Recently I watched a video of Barry giving a guest talk at The Stamps School of Design at the University of Michigan (2013). In this video, just under an hour long, she talks about Accessing the Imaginary. This includes some fascinating information on what neuroscience has revealed about knowledge, memory, and imagining. She tells some hilarious--and compelling--stories about small children and transitional objects and how that spirit of devotion to something "unreal" continues alive within all of us today. Find yourself an hour and treat yourself to this wonderful, laughter-filled talk about what lies at the center of our hearts, our minds, our imaginations, and our scribblings.